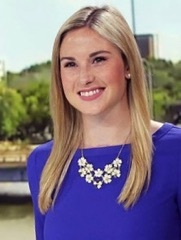 I am currently a Sports Reporter and Weekend Anchor at WIFR in Rockford, IL. I was a sports intern at WLS-ABC 7 in Chicago, where I covered Bulls and Blackhawks during the playoffs! I also was a sports anchor for Good Day DePaul. I was most recently a multimedia journalist at WREX in Rockford, IL working as a news reporter. I'm a 2015 graduate of DePaul University, where I double majored in broadcast journalism & PR/advertising and minored in event management.